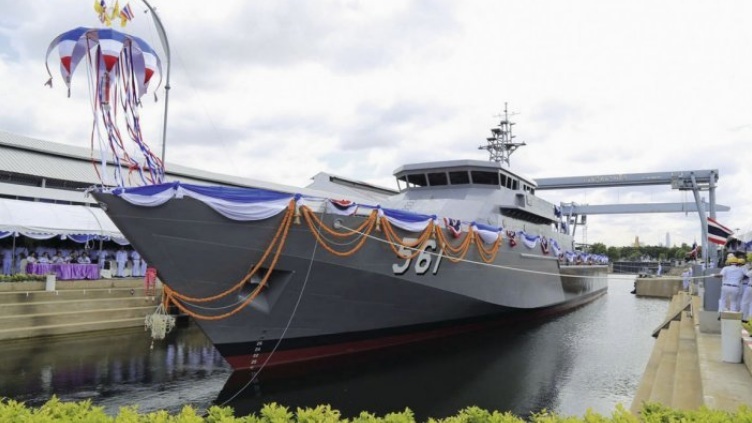 BANGKOK, -- The Royal Thai Navy's (RTN's) first M58 patrol boat has been launched, Thai shipbuilder Marsun confirmed to IHS Jane's on 7 September. The boat, Laemsing (561), was launched on 25 August at the RTN-owned Thonburi Naval Dockyard in Bangkok, Marsun's head of marketing Theerabhat Sroisena told IHS Jane's . The company first announced in December 2013 that it had been awarded the contract to build the 58 m vessel, which is the largest patrol boat the RTN has ordered from Marsun to date. According to specifications provided by the company, Laemsing is fitted with a 76/62 main gun, one stern-facing 30 mm cannon, and two 12.7 mm machine guns. The steel-hulled platform has a length of 58 m, a beam of 9.3 m, a draught of 2.5 m, and a full-load displacement of 520 tons. The platform is powered by three Caterpillar 3516C diesel engines driving one controlled-pitch and two fixed-pitch propellers. It has top speeds in excess of 24 kt and a range of 2,500 n miles. It has a complement of 53. Laemsing is currently scheduled for delivery in 2016. The vessel is expected to take on maritime patrol, search-and-rescue, and other constabulary and protection duties. 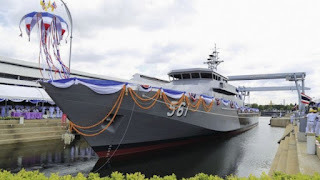 The Royal Thai Navy's M58 patrol boat Laemsing (561), during its launch on 25 August 2015.